The beginning of autumn is a fantastic time to enjoying snuggling up inside – unfortunately spiders have the same idea, which makes this time of year peak spider-spotting territory. A recent survey, which asked people across the country to record the time and date they saw spiders in their house has pinpointed evenings in September and October. The reasoning to explain this is that the rather scary looking house spider creeps inside to find a companion – and a dry home. Wet weather is said to encourage even more of the eight-legged household pests indoors as downpours can destroy webs that have been made in garden bushes. While spiders in the UK are generally harmless, the sight of a large male household spider will give most people a bit of a fright. 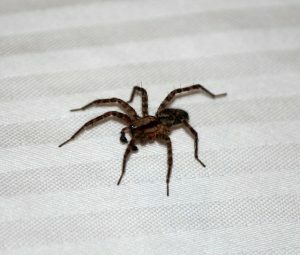 What is the best way to keep spiders out of your house? Tidy up: As with deterring all household pests the first suggestion is to keep your home clean and tidy. Fewer hiding places should mean fewer pests lurking in hidden spots. As always food crumbs are an attraction to household pests, so be scrupulous with cleanliness in the kitchen and at mealtimes. Block their way: Reducing the number of ways a spider could make its way into your home should be a priority – and will offer protection against other household pests. Seal up cracks, check vents are covered and that door seals and brickwork are in good order. Do conkers help to deter spiders? Spiders are said to be repelled by certain strong smells including citrus, garlic and mint. Using these fragrances around the home either in cleaning products or an essential oil spray could help to deter spiders. A popular remedy, although without any scientific backing, is to put conkers in the corners of rooms. Legend has it that the natural oils will help to repel spiders. Before introducing conkers or essential oils though it is wise to read up on any potential effects these could have on children and pets. As in deterring all household pests the best approach is a simple one – keep your house clean and minimise external access. This should go a long way to helping keep those spider surprises to a minimum! Should you experience a problem with household pests contact pest busters for a professional solution.